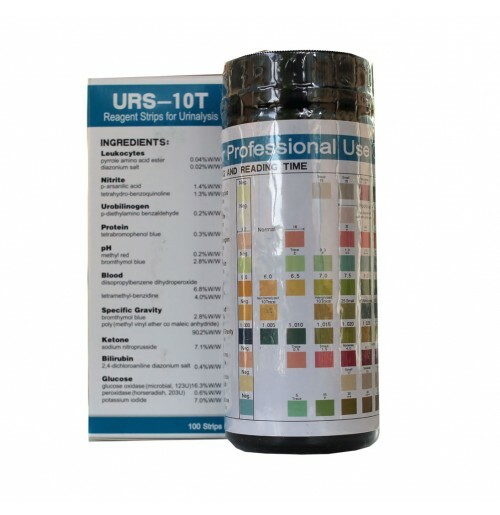 These urinalysis test strips, URS-K (Ketones) URS-3 (Glucose, Protein, pH) and URS-10 (Glucose, Protein pH, Leukocytes, Nitrites, Ketones, Bilirubin, Blood, Urobilinogen, and Specific Gravity) and URS-UTI (leukocytes and Nitrite) are simple, easy to use reagent strips for the detection of key diagnostic chemical markers in human urine. They are the same urinalysis test strips used routinely by doctors, laboratories and healthcare professionals in preliminary diagnosis of, and initial screening for potential health problems. URS-Strips are plastic strips to which chemically specific reagent pads are affixed. The reagent pads react with the sample urine to provide a standardized visible color reaction within 30 seconds to one minute depending on the specific panel screen. The color is then visually compared to the included color chart to determine the level of each chemical factor. Test results may provide useful information regarding carbohydrate (sugar) metabolism (diabetes), kidney function, acid-base balance, bacteriuria, occult blood, high leukocytes (infection) and other conditions of overall health. These urinalysis testing strips are ready to use upon removal from the vial and the entire reagent strip is disposable. URS-K, 3 & 10 reagent test strips are packed 100 tests to a vial with approximately one (1) year shelf life. Each vial comes with a complete abstract on the chemical and biological properties of the test including a color chart for rapid visual diagnosis. The URS-UTI urinary tract infection test includes one test strip per package with instructions printed on each package. Each vial of urinalysis reagent strips includes a color coded chart. The reactive color of each panel on the test strip is compared to the closest corresponding color on the result chart. The concentration level range for each chemical marker is indicated below each color block on the result chart. As with all tests dealing with color intensity or color matching, it is often recommended to obtain another person's interpretation of the test result. Shown to the left is the color result chart for the URS-10, ten parameter test strip. Each of the ten reactive reagent pads on the test strip are compared to the corresponding line of color blocks on the chart. The closest color match indicates the test result. Use of reagent strips are intended as an initial indication only of elevated chemical markers and not conclusive of a specific diagnosis. Further testing and consultation with a healthcare professional is necessary to confirm the presence of specific disease or health conditions. Your #1 Source for all of Your Drug Testing Needs.